LAS VEGAS (July 19, 2016) – The 47th annual World Series of Poker (WSOP) $10,000 No-Limit Hold’em Championship – commonly referred to as the Main Event – is down to its final nine players (aka the November Nine), who are each guaranteed at least $1,000,000 in prize money. 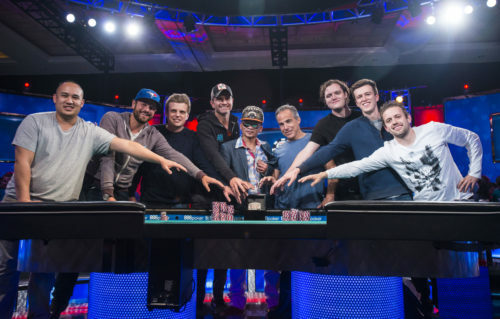 The “November Nine” is all that remains of the massive field of 6,737 players from 79 different nations who entered the iconic tournament seeking poker’s most coveted title, a top prize of $8,000,000 and the Jostens-encrusted gold and diamond bracelet. The final nine players represent five countries – Belgium, Canada, Czech Republic, Spain and the United States. The players will return to the Rio All-Suite Hotel and Casino on Sunday, October 30 to vie for poker’s ultimate trophy – a WSOP gold bracelet – and the lion’s share of the Main Event’s $63,327,800 total prize pool in front of live television cameras in primetime on ESPN. The winner will receive a guaranteed first-place prize of $8,000,000, with the other eight players sharing another $17+ million. Cliff Josephy from Syosset, New York is the oldest remaining player in the field at 51, but also the only one with a WSOP gold bracelet on his resume. In fact, Josephy has two, having won a $3,000 No-Limit Hold’em event in 2013 and a $1,500 Seven Card Stud event at the 2005 WSOP. All told, Josephy has $810,358 in WSOP earnings entering this Main Event and has won $2,641,420 lifetime in live poker tournaments. He also has some history in this event. Josephy has cashed twice previously in the WSOP Main Event, in 2008 (386th place) and last year, in 956th place. In addition, Josephy has invested wisely in this event previously. He was a financial backer of 2009 WSOP Main Event winner Joe Cada. With his guarantee of $1 million for reaching this final table, Josephy will have his largest career cash. Qui Nguyen is the only Las Vegas, Nevada resident. He’s a 39-year-old poker pro and gambler with just $9,029 in WSOP earnings – less than the $10,000 it cost to enter this event. He has just one previous WSOP cash and only $52,986 in lifetime tournament poker winnings. This marks Nguyen’s first time to cash in the WSOP Main Event. He entered three WSOP events this summer, his Main Event journey, marking his only cash. Nguyen’s best finish was his 54th place finish in the 2009 WSOP, in a $1,500 No-Limit Hold’em event. Gordon Vayo is a 27-year-old San Francisco, California resident and poker pro with 26 career WSOP cashes worth $608,136. With the guarantee of at least $1 million for reaching this final table, Vayo will nearly double his career $974,714 in earnings. In 2014, Vayo finished in second place in a WSOP $3,000 No-Limit Hold’em 6-Handed event, winning $314,535, his biggest poker score prior to this accomplishment. This marks Vayo’s first time to cash in the WSOP Main Event, but he’s had a good summer, playing 21 WSOP gold bracelet events and cashing in eight of them. For the second consecutive year we have a Belgium-born player at the final table. 34-year-old Kenny Hallaert hails from Hansbeke, Belgium and he’s amassed 22 WSOP cashes and $367,855 in winnings. He’s an accomplished poker tournament director with $1,317,530 in career live tournament winnings, including a sixth place finish at EPT Deauville in 2011 that paid him $210,962, his largest score prior to making this final table. Hallaert is no stranger to going deep in this event or other large WSOP events, as he’s twice cashed previously in the WSOP Main Event (2015: 123rd) and (2011: 323rd). In addition, in the inaugural WSOP Colossus event, the largest live poker tournament in history with 22,374 entries, Hallaert finished in fifth place, earning $182,348 for his $565 investment. He’s now guaranteed to add at least $1 million more to his bankroll and is in good position at the final table. Hailing from Hoboken, New Jersey, 28-year-old Michael Ruane is as big as a surprise to be at this final table as anyone. He has just $24,438 in WSOP earnings, all coming from three previous WSOP cashes. His biggest cash previously was for $17,244, so the $1 million he is guaranteed is by far the biggest prize he’s earned in poker. This marks Ruane’s first time to cash in a WSOP event, and he has lifetime live poker tournament winnings of $44,962. He only played two events at this year’s WSOP, and his deep run in the Main Event makes it quite a successful journey for Ruane who makes his living as a poker pro. Vojtech Ruzicka entered the final day of play with the chip lead and managed to keep himself squarely in control. The 30-year old from Prague, Czech Republic becomes the first Czech to make the final table since Martin Staszko in 2011. 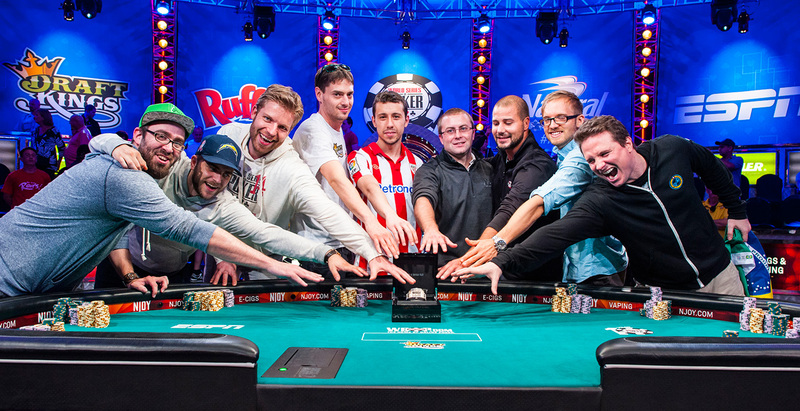 Staszko finished in second place, and no player from the Czech Republic has ever claimed the WSOP Main Event crown. In fact, Tomas Junek (2012) is the only WSOP gold bracelet winner from the Czech Republic. Ruzicka has 17 previous WSOP cashes totaling $138,585 and has won $1,149,027 lifetime on the live poker circuit. Ruzicka is a poker pro who played 18 WSOP events this summer, cashing in four. This marks his first time to cash in the WSOP Main Event. He has claimed a victory before, winning the 2013 EPT Deauville High Roller No-Limit Hold’em event for $426,907. However, this $1 million he is guaranteed for reaching the WSOP Main Event Final Table will be his largest ever live poker cash. Our only Canadian at this final table is 31-year-old Griffin Benger from Toronto, Ontario, Canada. Benger has already won $2,395,406 in live poker tournaments, and even has a previous $1 million victory, claiming first place in the 2014 Shark Tank session in London. Benger has 13 previous WSOP cashes totaling $231,201 and his previous high finish at a WSOP event was twice finishing in 14th place, once in 2012 and again in 2013. Remarkably, this Main Event was the only event Benger entered at the 2016 WSOP, and he’s done well in this event before. He’s cashed twice, once in 2014 in 90th place and prior to that in 2012 in 304th place. Benger also has a successful history with other games, having previously been a world champion in the Counter-Strike computer game, and was ranked as the No. 1 online poker player in 2011. Benger, a poker pro, looks to become only the second Canadian champion in this event and first since Jonathan Duhamel took the crown in 2011. Brooklyn, New York resident Jerry Wong becomes the second New Yorker to be featured at this final table, alongside Josephy. The 34-year old poker pro has career WSOP winnings of $118,156 coming on 19 previous cashes. In total, Wong has won $1,317,539 in live poker tournaments, including a $725,000 prize for coming in third place in the 2013 PCA in the Bahamas. Wong played 16 WSOP events in 2016, cashing five times. His guaranteed $1 million payday is his biggest tournament prize. Prior to that, his biggest WSOP cash came in the 2012 WSOP Main Event where he finished in 309th place for $32,871, the only other time he has cashed in this event. Hailing from Palma, Spain, is 37-year-old Fernando Pons, who is an account executive for a retail chain. He has never cashed previously at the WSOP and has only won a total of $10,589 in live poker tournaments – just a few hundred dollars more than the buy-in for this event. This was the only event he came to play at the 2016 WSOP and prior to the $1 million he’s locked up in this event, Pons’ biggest live tournament cash was for $4,059 for finishing in 56th place in a $1,500 No-Limit Hold’em event in Las Vegas in 2014. He is the first Spaniard to make the WSOP Main Event final table since 2014 when Andoni Larrabe finished in sixth place. He can follow in the footsteps of Spain’s legendary card sharp, Carlos Mortensen, who captured the WSOP Main Event crown 15 years ago, in 2001. Mortensen won $1,500,000 that year and Larrabe won $1,622,471 for his finish, so Pons just needs to finish fifth or higher to have the biggest Spanish score in WSOP Main Event history. Fellow Spaniard Adrian Mateos won the 2013 WSOP Europe Main Event title, taking home 1 million euros. Josh Weiss from La Jolla, California was the tenth place finisher. Play ended at 11:53 pm Pacific Time in Las Vegas on Monday, July 18 when Michael Ruane in the small blind and Gordon Voya in the big blind called Weiss’ 850,000 all-in bet. Weiss’ Ace-Eight was racing against Vayo’s Queen-Seven and Ruane’s Jack-Five. The board ran out Jack-Seven-Three-Five-Four, giving Ruane two pair and eliminating Weiss. Weiss walks away with a nice $650,000 consolation prize. When play resumes October 30, the players will pick up with 32 minutes and 50 seconds remaining in Level 35. The antes will be 75,000 and blinds will stand at 250,000 and 500,000. Comprehensive WSOP Main Event television coverage will begin airing Sunday, September 11 at 8:30 p.m. Eastern on ESPN2. Coverage will continue in two-hour blocks each Sunday at 8:30 p.m. until October 2 when it moves to ESPN at 8:30 pm with 2 ½ hour blocks and continues in that regular Sunday slot culminating with three-night primetime Main Event Final Table live coverage October 30 – November 1, 2016. The 2016 Main Event capped the largest-ever WSOP in terms of entrants in the 47-year history of the event. 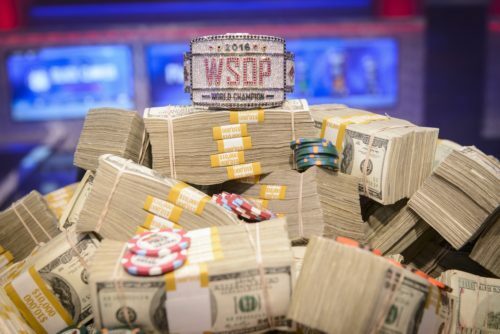 A total of 107,833 players from 107 countries entered the 69 events on this summer’s WSOP schedule, generating a total prize pool of $221,211,336. The World Series of Poker (WSOP) is the largest, richest and most prestigious gaming event in the world, awarding millions of dollars in prize money and the prestigious gold bracelet – globally recognized as the sport’s top prize. Featuring a comprehensive slate of tournaments in every major poker variation, the WSOP is poker’s longest running tournament in the world, dating back to 1970. In 2016, the event attracted a record 107,833 entrants from 107 different countries to the Rio in Las Vegas and awarded more than $221 million in prize money. In addition the WSOP has formed groundbreaking alliances in broadcasting, digital media and corporate sponsorships, while successfully expanding the brand internationally with the advent of the World Series of Poker Europe. For more information on the World Series of Poker, please visit www.WSOP.com.